The first question to ask when discussing leather care is whether or not you have leather. This may seem like an obvious answer but it isn’t always the case. Manufacturers cleverly label imitation leather (read: vinyl) with terms like “leatherette” which can be confusing. In addition, many of today’s vinyl that is intended to look like leather really does look quite a bit like leather. If you have leatherette or vinyl, don’t feel badly. With the quality level where it is today, some might argue that it’s a better option: sure, it isn’t real leather but it looks a lot like it and is certainly much easier to care for! 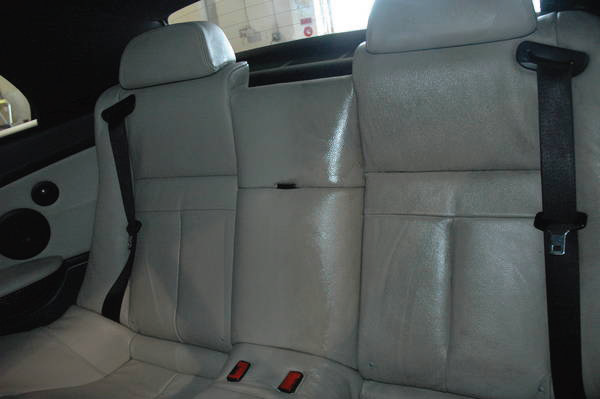 Note that proper leather care is especially important for the MINI lounge leather. This leather is a softer, more sensitive leather (not to mention gorgeous!) than other leathers. However, as long as you keep a regular cleaning and conditioning routine, it will last a lifetime. Read on for more details on how best to do so. Real leather is a material that requires specific, regular care. Unfortunately, there are very few corners to cut, if any, in proper leather care. After all, it is a natural hide made from something that was once living. To illustrate in detail what you’re working with when caring for leather, please read on. I have selected excerpts from a document written by the makers of Leatherique, who have been in the leather industry for several generations and who know leather better than anyone I know. Although I’ve edited, revised and added to some of the selections, much of the raw content comes from the industry’s leading leather experts. I’ll warn that this will probably be more about leather than you ever wanted to know but it is also an excellent way to truly understand how to properly care for your MINI’s leather. Dirt has come to the surface after oil was rubbed in and car sat in the sun all day with the windows closed. Leatherique Prestine Clean is used to clean the leather. 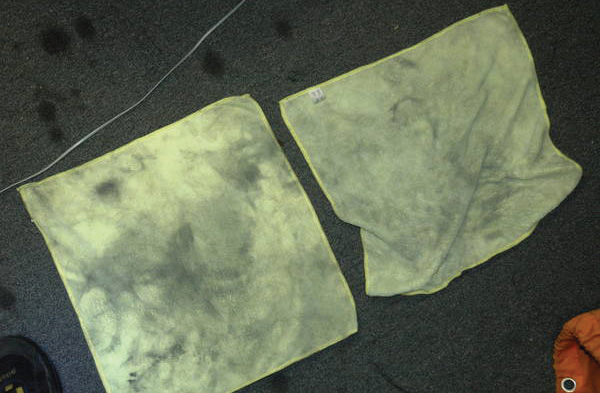 Starting with clean towels, you can see how much dirt was removed from the leather. The towels before and after. Genuine Leather…The word alone invokes imagery and fantasies of opulence: “King of Fabrics — Mark of Luxury” — the unmistakable aromatic fragrance that is derived from individual tanning processes, the luxurious suppleness and sensuousness, all excite our senses. Genuine leather cannot be imitated and has no substitute for strength, durability, and restorability. Because leather is a natural product that was once living and is now unable to care for itself, it requires maintenance, just as our skins do. Proper maintenance will help your hides stay like new for many generations. Tannin was one of the advances of leather tanning, perfected by the ancient Egyptians and used also as part of their embalming process. The process is based on the fact that tannin, a bitter ingredient found in vegetation, will combine with the proteins of the skin, forming a chemical compound that resists decay. By the early 19th Century, the Industrial Revolution revolutionized tanning, and large tanneries were formed. The historic Connolly Leather Tannery began at this time, and the historical Wimbledon-based company, which was in business for over 130 years graced not only Rolls Royce, Bentley Jaguar, and Ferrari motor cars, but was found on the distinguished red and green seats of the British House of commons, the House of Lords, and many luxury hotels world wide. Because the ancient vegetable tanning method is so time consuming (it takes several months), modern tanners use chromium salts to produce the same results in less than 24 hours. To prepare the skins for tanning, they are sprinkled with salt or immersed in brine within a short time after the animals are killed. This process preserves the skins by partially dehydrating them and by killing certain bacteria. The salting process, however, does not preserve the skins indefi nitely, so they are tied into bundles and shipped to the tanneries. After several “prep” steps, the hides are ready for splitting & coloring. Before the skins are dyed to the desired color, they are usually split by machine into several layers and thicknesses. “Top Grain” is so called because it is the original surface — or first layer, as the name implies. “Split Grain” or “flesh splits” are the subsequent layers. 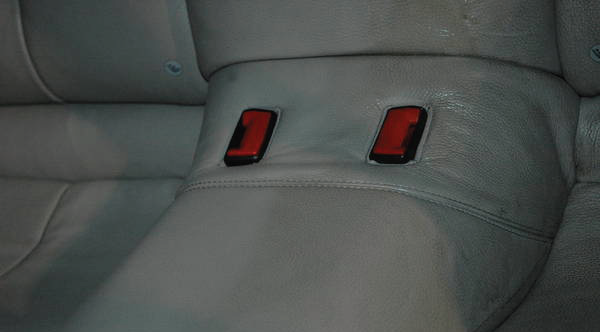 Thicker top grain leathers are used for upholstery (particularly automobile) and thinner leathers are used for furniture and wearing apparel where a softer “hand” (draping ability) is desired. If the skins are to be colored throughout, the preliminary coloring operation is carried out in drums or with rollers. The hides are impregnated with either natural or synthetic dyes. When a hide is colored throughout its entire thickness, it is known as “vat dyed” — although it is not necessarily soaked in a vat. These colors are somewhat limited though, and usually these “vat dyed” hides are eventually surface coated as well. Not all leathers are vat dyed, but nearly all leathers are surface coated. This is done to protect the surface and extend the life of the hide. Even a grain of sand worn into the natural fibers of leather can wear a hole. Hides that are not surface coated with a colored finish are waxed to create a more natural, but still protective finish. Prior to World War II, most leathers produced were finished with a surface sprayed lacquer process. Colors were dark and limited in number. Usually these colors faded quickly and oxidized into unpleasant hues. These lacquered surfaces were thick and durable, and often remained intact. However, the leather still became dry and stiff. By the late 1980’s, it was found that the tanning process involving nitrocellulose lacquer was harmful to the environment. If your vehicle predates 1990 and nitrocellulose lacquers were used in dying the leather, here is what’s happening to the surface: Nitrocellulose lacquers were brittle surface colorants generally used on the exterior metal surface of the automobile body. Flexing agents or plasticizers were added to keep them from cracking. 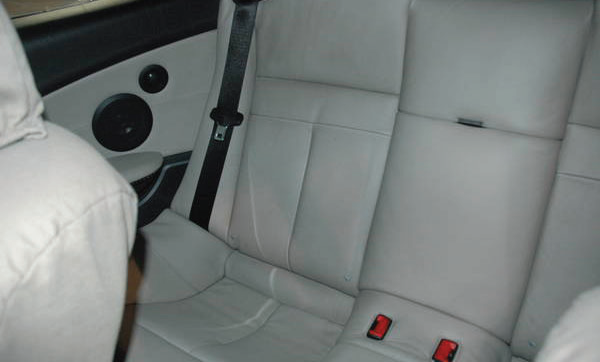 The coloring of leather required additional plasticizers for added flexibility. There was a delicate balance which had to be maintained. Although the addition of plasticizers increased the flexibility of the lacquer, the durability decreased. The surface became more subject to wear and abrasion, and the actual adhesion of the lacquer to the leather diminished. It loosened where flexed and chipped away. Because these colors were generally sprayed on the surface, they were further reduced with thinners for even application. The actual thickness of the lacquer finish was extremely thin. Thicker applications would create a loss of suppleness and inhibit the leather’s ability to “breathe.” Plasticizers were also unstable; they underwent a chemical change and migrated into the atmosphere or, quite simply, disappeared. What remained on the leather surface was a stiff, brittle, non-porous coating, which in itself is bad enough. However, it further restricted the ability of the leather to flex and breathe, and actually accelerated the deterioration process. Once begun, this aging process progressed more and more rapidly. If old leather is not properly cared for, a sudden flexing will sometimes result in actual cracking like folding old, dry cardboard. Old seats have actually been known to “shatter” or develop a hole when pressed or sat upon. 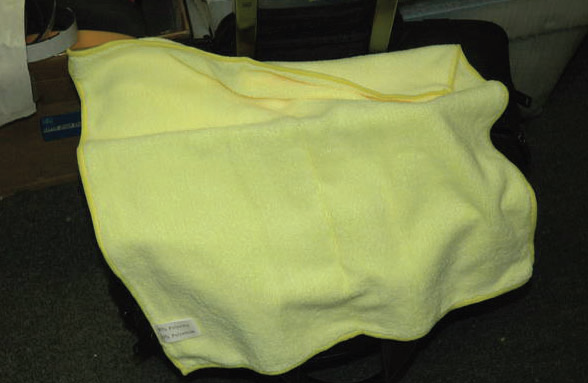 Most hides manufactured world wide since the 1990’s have polymer coating finishes which wear extremely well. But even with these coatings, the leather beneath will eventually dry out if not cleaned and conditioned periodically. Our most important lesson at this point should be to realize that leather was once a living, organic material, that is now unable to produce for itself what it needs to remain in its like-new state. We appreciate that leather is outer protective epidermis of an animal, treated to stop decomposition, soaked, rolled, dried, oiled, stretched, split, dyed, dried again, softened and colored. The natural spongy leather fi ber structure is omnidirectional — it has no particular direction or pattern. It will stretch in all directions with no particular grain pattern or stress. Over time, the natural tensile strength and elasticity that the hide once had becomes diminished. The surface coating, sitting over leather fibers that are becoming less plump eventually develop omni-directional spider web cracks not initially visible to the naked eye. Repeated flexing and stretching eventually causes the color surface coating to chip away in certain areas and eventually the natural leather color beneath becomes visible. Usually this appears to be a crack in the leather. It is not a “crack,” though; it is merely the absence of surface colorant running in a patterned direction (wear creases). Also, towards leather in motor vehicles or furniture, many clothing fabrics act like 600 grit sand paper. Jeans, cords, chinos constantly rubbing against the finish can break it down, and create wear, decrease of the finish, and then as the fragile fibrous leather fibers become exposed, it is worn down to become holes and tears. Time, heat, UV rays of the sun, wear and use also dry the actual hide, causing it to become less resilient. Because leather is fibrous, it also absorbs anything that it comes in contact with. Leather hides are each different and distinct. We can look at them as art, and appreciate them as one would appreciate natural marble, granite, and fine wood. Because leather was once a living organism, it needs to be maintained just any other living organism does. Oil and water are enemies to leather. Oil based products tend to sit on the surface of leather and cause long-term harm to your leather. All of the above will clog your leather’s pores, ultimately leading to drying out and a lack of pliability. Caveat emptor! Many of brands on the general market contain about 90% water with the balance petroleum oils and artifi cial fragrance. When applied to the leather surface, it appears to “soak in” rapidly, but in fact it is the water on the surface that is evaporating leaving only a thin film of oil to make the surface appear slick and temporarily shiny. Silicone based products are among the worst offenders to leather. The silicones impregnate the hides, soaking into the pores of the leather fi bers and causing the hides to become stiff . The silicone also causes a “hazing” (off-gassing) on your windows, and door seals over time, and can be diffi cult to clean. Saddle soap is also too harsh for use on anything but saddles. It was formulated to clean sweat and trail dirt out of thick full grain leather. On finished leathers, it removes surface color, and it is also drying to leather. **Cleaning leather frequently prevents the leather’s pores from clogging by general use: dirt, grime, perspiration, etc. Once the pores have clogged, your conditioners have a difficult task of penetrating the leather to hydrate it. So, by not cleaning regularly you are actually aiding in the ultimate drying out of the leather. In an ideal world, leather should be cleaned with a high quality, pH-balanced leather cleaner 1-2 times per month. However, this level of maintenance is often impractical for most people. A perfectly acceptable compromise is to “dust” your leather 1-2 times per month with a slightly damp cloth or even a dry cloth. 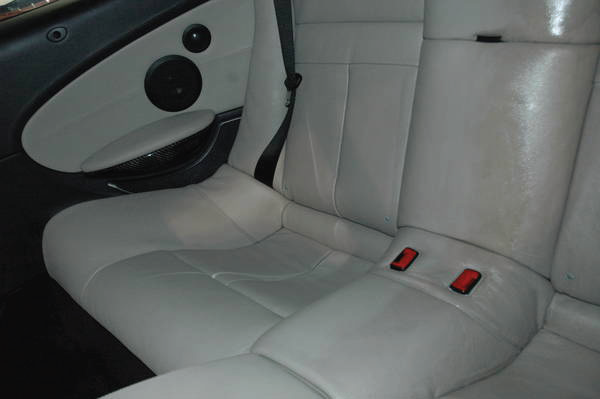 Then, thoroughly clean with a high quality, pH-balanced leather cleaner every 2-3 months. **Conditioning leather is of course also important. For the average situation, you should condition leather every 2-3 months. Especially for those with seat perforations or those who become easily annoyed with conditioners gumming in their seams, Prima Nourish is a high-grade leather conditioner which was designed work particularly well with perforations and seams while deeply conditioning the leather. Over some time and even with diligent cleaning and conditioning, the pores are bound to become clogged. Using a “purging” product (ie, Leatherique) is the only way to unclog the pores. For the average situation, you should use such a product once per year or so. This kind of product also does wonders for older, tired leather which needs rejuvenation. As a general rule, products that are cleaner-conditioners are not good for leather. These cleaner-conditioners are marketed to the convenience crowd at the expense of the poor leather. It is verydiffi cult to chemically combine pH-balanced cleaners with effective and safe conditioners. Therefore, it is best to avoid cleaner-conditioner products despite your temptation for an easy care option. 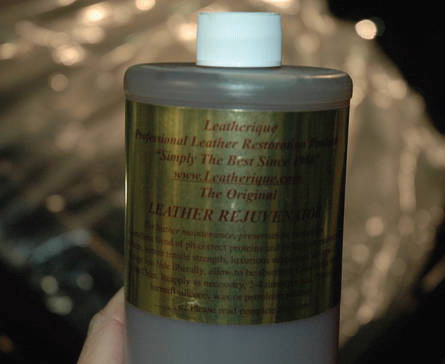 Most enthusiasts think of conditioning leather when they think of leather care. The task of cleaning leather is often thought of only after the leather is visibly soiled. Unfortunately, this is backwards! 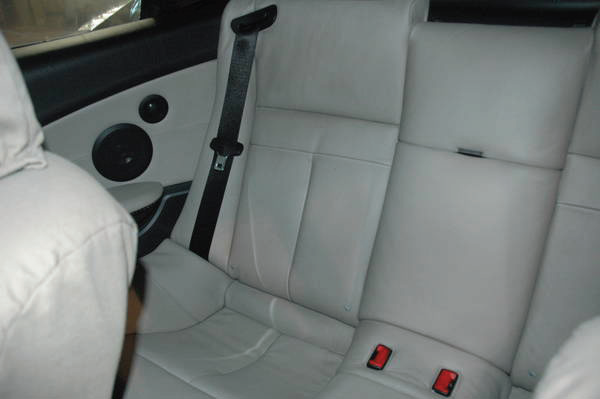 As described above, frequent cleaning, even if only brief and minimal due to time constraints, ultimately aids in the conditioning, proper care and long life of your MINI leather as much as, if not more than, conditioning itself. May your MINI’s leather live long and stay soft and supple!